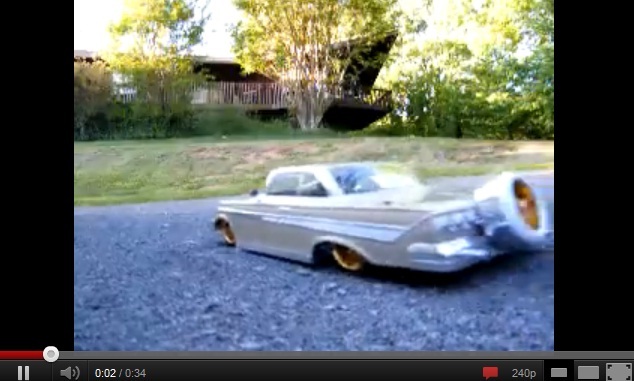 This is a video of a radio control ’61 Impala low-rider with functional hydraulics. It is just about as cute as anything. It rides on a scratch-built brass frame and it does all the standard low-rider moves. Click it for the short but worthwhile video. Awwww! It’s videos like this that prop up my faith in humanity. It even drags its rear bumper! This entry was posted in 1960s, Custom, It's Electric!, Items of Interest (Not for sale), Sweet videos. Bookmark the permalink. Nice! I’ll do that. That car is great, thanks for sharing.